Halifax council has ordered staff to further study a fix to the Macdonald Bridge. In short, the options are to build one of two ramps over traffic on North Street or to do nothing. 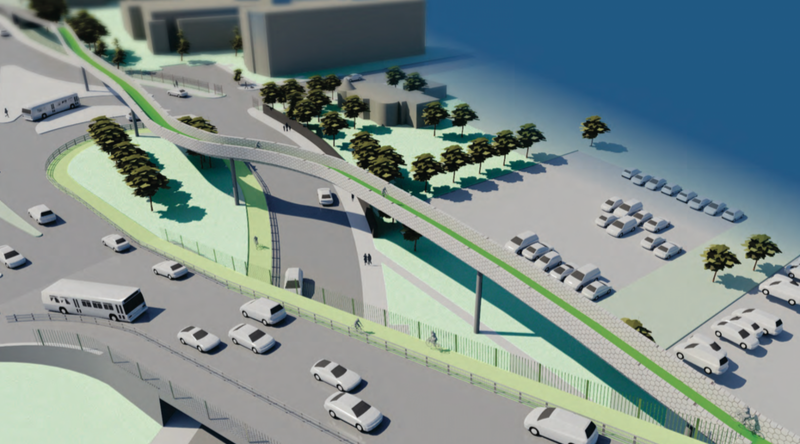 The Halifax Cycling Coalition believes that a flyover ramp would create a connection that makes crossing the bridge safe, convenient, and accessible to people of all ages and abilities. This is a critical connection between Halifax and Dartmouth and would dramatically improve the experience of crossing the harbour, removing another of the many perceived barriers between residents of Halifax and Dartmouth. The latest staff report from the Transportation Standing Committee on July 27th, 2017 can be found here. More information about fixing the Macdonald Bridge is available on Shape Your City and the presentation to the Active Transportation Standing Committee. HCC summarized the proposals public presentation in a short video to highlight the main concepts of the designs option. Summary of the flyover options to access the Macdonald bridge bike lane. Who is designing these changes? The city received a preliminary design from WSP/Architecture49. The city then contracted Parsons Corporation in early 2016 to conduct detailed design work and public consultation to ensure an all ages and abilities-friendly approach to the bridge. Why do we support the $2 million flyover ramp on the Macdonald Bridge? 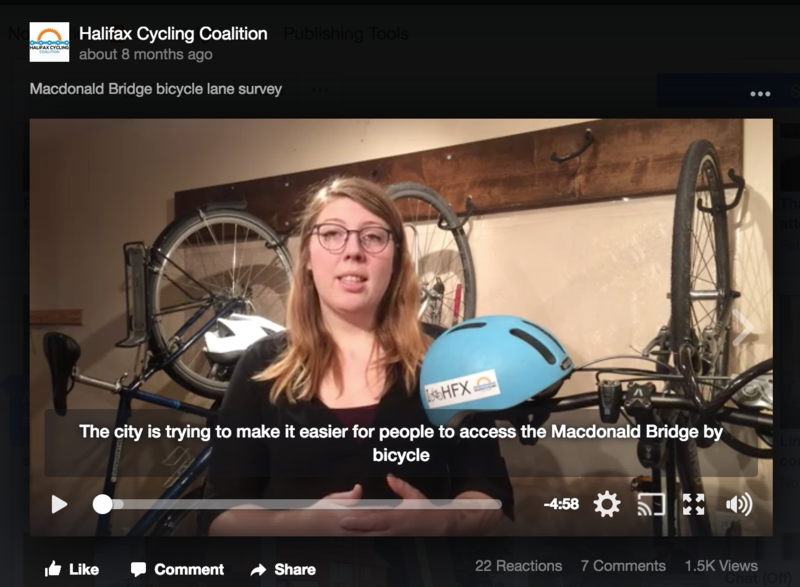 Since city council’s recent decision to pursue a fix to the Macdonald Bridge bicycle lanes we have received a few questions. The most frequently-asked question is why we support the $2 million flyover ramp option. The answer is simple: this is the only feasible option that makes the bridge accessible to cyclists of all ages and abilities. Is $2 million a reasonable amount to spend on people on bicycles? The city is broke! $2 million is a reasonable amount to spend on bicycle users. 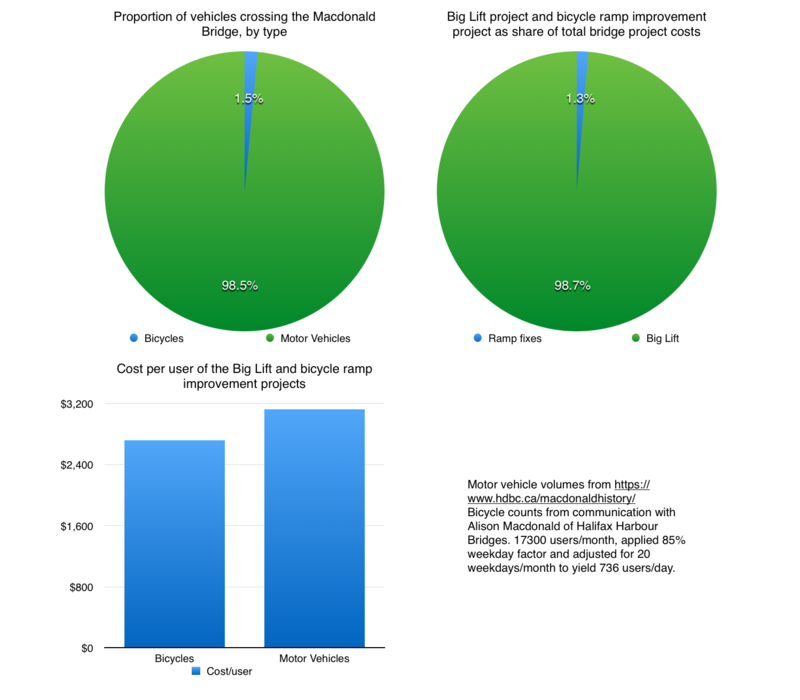 The Big Lift project costs nearly $3,200 per car. 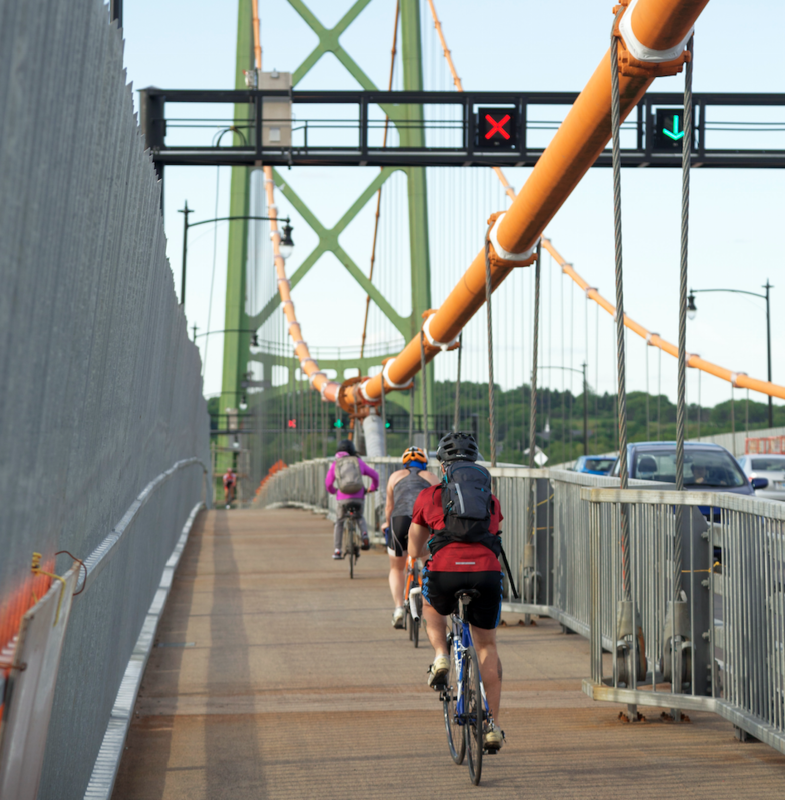 The ramp for bicycles would cost about $2,900 per current cyclist, but based on evidence from Vancouver, a more accessible connection to the Macdonald Bridge could at least double the number of people using bicycles to cross the bridge. If we don’t get more people across the bridge on bicycles or using transit we’ll need to build a third crossing, which could cost over $1 billion. That’s billion with a B, or $2,500 per Haligonian. That’s the average family’s property taxes for two years, just for a bridge. On top of this, the city doesn’t have to pay for the ramp alone. The Federal and Provincial Governments are likely to contribute up to 1/3 each through programs such as Connect2, the Blue Route, the Trans-Canada Trail, and other infrastructure programs. Finally, the evidence shows that riding a bicycle saves the government money by improving our health, increasing productivity (healthy employees are more productive employees) and reducing our reliance on out-of-province imports such as oil, gas, and cars. The cost of the bridge bicycle lane project is in line with the money spent on the big lift, on a per-user basis. Why not switch the bicycle and pedestrian lanes? This option is not feasible. Moving the pedestrians to the north side of the bridge means they would have to navigate the steep hill to Barrington Street instead of putting cyclists on this side. Because of the vehicle traffic volumes crossing the bridge a crosswalk cannot be added at the top of the ramp to allow pedestrians to cross. This means either pedestrians or cyclists ultimately have to either use an overhead ramp or descend to Barrington Street. Requiring pedestrians to use the North side also extends the trip for the average pedestrian (coming from or going to downtown Dartmouth), who move more slowly than cyclists. Swapping the pedestrian and cycling lanes simply shifts the burden from one group to another, as such it is not something we can support. Why can’t pedestrians and cyclists share both paths? The paths are too narrow to share safely. The minimum recommended width for a shared path with the bridge’s traffic volume is 3.0m per direction of travel. (Link to PDF) The bridge bicycle and pedestrian lanes are only 2.6m wide. Another explanation of the problem can be found on View From the Cycle Path. If we use the south side for travel to Dartmouth and the North side for travel to Halifax, you’re still forcing pedestrians to take a major detour (see the above answer for an explanation of that problem.) To have both bicycles and pedestrians on both sides of the bridge would require paths that are 6.0m wide. The bridge commission feels that the bridge can’t support this additional weight, limiting the paths to their current width. Why would a wider path make the bridge too heavy? The bridge was built with two car lanes and two sidewalks. In 1999 the sidewalks were removed and a third lane added. To compensate, the bike lane and sidewalk were added to the outside of the bridge. These cantilevered extensions, plus the weight of the third lane of cars, cause the bridge to get very close to its rated weight limit. This is why the bike lane and sidewalk had to come off for the redecking project – engineers feared that with the added weight of the lifting gantry (that big yellow thing that lifts the new pieces in place) the bridge could exceed its design limit, which could lead to a collapse. What about leaving the bridge as-is? The option of keeping the bridge as-is, with the steep ramp to and from Barrington Street, means the bridge would remain a deterrent to much of the population. The city says “challenging grades coupled with the need to share a busy road makes the existing connection suitable only for experienced, confident bicyclists.” (Link to PDF) Some sort of flat approach to the bridge would make it safe and accessible for people of all ages and abilities, leading to much higher usage of the bridge bicycle lane. The #2 request in the Active Transportation Priorities Plan is to make a better connection to the bridge. This was rated behind only the construction of a comprehensive network of bicycle lanes in the Regional Centre (Halifax Peninsula and downtown Dartmouth). Simply put, not only is this option not acceptable to cyclists, it is the preference of many citizens to fix the bridge. Can we cut a hole in the fence? Cutting a hole in the fence does very little to make the MacDonald Bridge accessible to people of all ages and cycling abilities. The design of the flyover ramp addresses the other barriers to riding on the bridge such as busy intersections, lack of bike lanes to and from the bridge, and conflicts with the transit stops. Imagine if you had to navigate the rush-hour traffic in the intersection to get onto the bridge bike lane? A crucial element of the flyover ramp is that it bypasses the conflict areas between cyclists, cars, transit and pedestrians, and drops cyclists off in a safe area as opposed to the middle of a busy intersection.